When you choose E. B. O’Reilly Servicing as your service provider, our highly trained work force and dedicated account managers will work diligently to ensure your satisfaction at all times. We’ll help you keep your system operating at peak efficiency at all times and avoid costly downtime. According to the Consortium of Energy Efficiency (CEE) up to 50% more energy can be saved with proper installation, sizing, and maintenance of commercial central air conditioning and heat pumps. Proper maintenance is the most important aspect in prolonging the life of your equipment and keeping your utility costs down. An improperly maintained air conditioning unit could potentially increase your utility costs by 15% - 20%. By not maintaining your equipment, the compressor, evaporator fan motor and condenser fan motor all work harder to maintain the desired temperature. As you can see, good service doesn’t cost – it pays. Customers who contract with E. B. O’Reilly receive a number of benefits including but not limited to a discounted labor billing rate. Also, when our contract customers experience an emergency, our service technicians are available to respond twenty-four hours a day, seven days a week. We’ll correct the problem fast. Often, there is little or no interruption in service. Every E. B. O’Reilly Servicing Corporation technician has received extensive training through the Steamfitters Union Local 420 in all aspects of mechanical equipment servicing, including electric motors, refrigeration, large tonnage chillers, compressors, heating and cooling systems, air handlers, pumps, electronics, computer controls, automation in HVAC systems, compressor overhaul, and much more. This training includes the completion of a five-year Apprenticeship Training program where the technician gains experience in all aspects of mechanical service and maintenance of commercial air conditioning, refrigeration, ventilation, and heating equipment. E. B. O’Reilly’s service technicians are well-trained, knowledgeable and experienced. 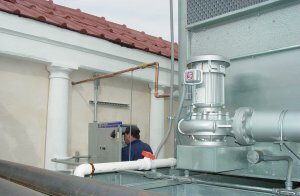 When you contract with E. B. O’Reilly Service, you can be confident that your HVAC system will be well-maintained and serviced and will operate efficiently and economically throughout its life cycle. 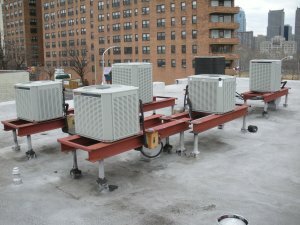 Keeping your HVAC systems up and running !